I did this walk on the 1st February 2007. I drove from Walthamstow and parked on the main road in Much Hadham, close to the road leading down to the church. I then walked over to join the start of the Hertfordshire Way's Much Hadham loop by a ford over the River Ash from where I walked the Much Hadham loop in the reverse direction to the guidebook. Once again I was very lucky with the weather and it was a beautiful sunny morning, mild and still, with thin strands of mist rising above the rivers I passed on the way there. From the ford over the River Ash, photo 1, at the start of the Much Hadham loop, where I saw a couple of Grey Wagtails, the Hertfordshire Way heads up a tarmac footpath that runs between houses that leads to the main road through the village, photo 3. Leaving the ford, photo 7, the path heads off to the left, heading gently uphill diagonally across a field. Leaving the field the route then runs along a road for a very short distance before turning right to join a path that runs alongside the edge of a patch of woodland, photo 8, running slightly above the river. Just past then end of the aptly named Sidehill Wood the Much Hadham link path joins up with the main route of the Hertfordshire Way where I had finished my walk on day 3, photo 9. The route then turns left to head uphill besides a field towards another small patch of woodland. At the top of the hill the path turns left then right to cross a field, photo 10. I really couldn't believe how warm the weather was. There was a thin film of dew on the grass, bright sunshine dead calm and really mild. I have known worse weather wise in the middle of summer. The route turns right by a tall tree, and then left again a short while further on, to head down past farm buildings and into the grounds of the Henry Moore foundation at Perry Green. A number of sculptures, photo 11, can be seen from the footpath before the route heads down a driveway to cross a road to take a footpath into another set of fields, photo 12. More photo's of the sculptures can be seen by clicking the green text under photo 11. Although I was walking quite fast, and for once feeling quite fit, I was making slow progress along the route as I was using my new camera for the first time, continually stopping to take photos to see how it worked. The Hertfordshire Way continues along the edge of the fields for some distance with quite expansive views on either side. 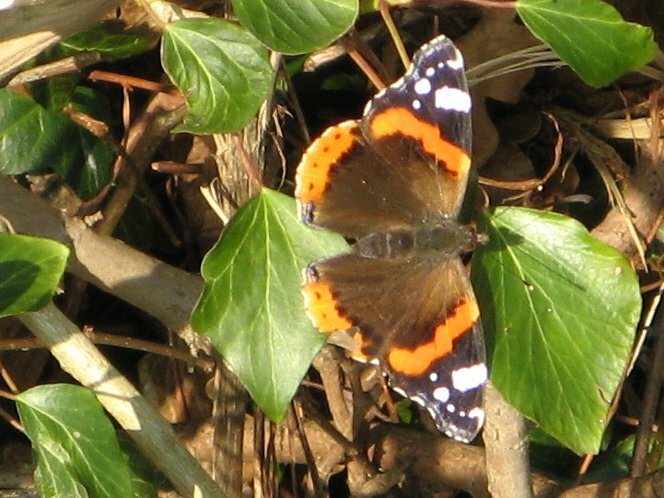 Passing a hedge I spotted a couple of butterfly's sunning themselves in the warm weather, photo 13. Just before a house the path turns right continue over fields, photo 15, to head under some electricity pylons. Although I didn't see any deer during this walk I saw lots of their footprints in the soft mud besides the fields. The path turns left along a track where I saw a flock of Yellowhammers in the field besides the path. This track runs down to a road which is crossed and then runs along a bridleway which is signposted Thorley Church, 1 ½ miles. This heads along a concrete track towards Mathams Wood, photo 16. The route bears left from the track into a short stretch of woodland where it passes an old pillbox before heading down besides a field to turn to right over a small bridge. Thorley Church can be seen on the horizon in the distance as the path continues along between fields. in one of these fields was a very large haystack, photo 17, not something I see very often. As I headed towards Thorley church the wind started to pick up slightly and the skies began to cloud over. Although it was very peaceful in the countryside this part of the walk was often accompanied by the sound of planes taking off from the nearby Stansted Airport. By a barn at Moor Hall the path becomes a concrete track which although not the best surface to walk along did allow me to step up the pace for a while. The path heads through the churchyard of St James the Great at Thorley and joins Church Lane. I spotted a number of goldfinches in a hedge close to the church. Church Lane is followed down into Thorley Lane East. At the end of Thorley Lane East the route heads left along a road for a short distance before crossing over a stile on the right. The path then runs along the edge of field, skirting the edge of Bishops Stortford, as it runs down towards the River Stort. Leaving the field the path heads down between houses to cross over the very busy B1383 London Road before taking another path that leads down to cross over railway lines, photo 18. From the railway lines it is just a few yards further on to the River Stort, photo 19, which is crossed over a small metal bridge. The Hertfordshire Way heads off to the left along the towpath up to Twyford Lock, photo 20, where the route leaves the towpath to head up the road to the left for a short distance before taking a footpath that bears off to the right over fields. After crossing a scrubby field the route joins a lane which leads to a crossing back over the railway lines. The route then passes through the edge of an Industrial Estate and into Twyford Road before turning right along B1383 London Road that was crossed earlier. Crossing over the River Stort the route heads back down to rejoin the towpath besides the river, photo 21. When walking this I wondered why the route did not stick to the towpath from Twyford Lock but having read the guidebook it seems this would have meant the Hertfordshire way straying into Essex! The towpath is followed up to Station Road where the route leaves the towpath and heads to the left and then right into Riverside. There was a lot of building work going on in the area and I took a diversion and went along a path between shops that led up to Potter Street. It was lunchtime and the whole place was very busy. I did not spot any Hertfordshire Way signs in Bishops Stortford and not paying attention I wandered off route, heading up North Street, photo 22, and on to Northgate before I realised I was going the wrong way. Earlier, when leaving the towpath, I should not have gone into Riverside either but continued up to South Street as the route as described in the guidebook takes a slightly different course than that shown on my map. Retracing my steps I picked up the Hertfordshire Way as it headed up the High Street, past the impressive, but impossible to photo, St Michael's Church. Continuing on into Windhill the route bears left into Bells Hill and then takes a footpath marked Windmill Fields, off to the left that runs down besides the buildings of St Mary's Catholic School. This footpath continues for some distance heading gently uphill besides school buildings before entering an open space of playing fields, photo 23, on the edge of Bishops Stortford. By a hedge at the top of the hill the footpath turns right and leaves the playing fields along a very muddy track. The Hertfordshire way then turns left up a road and then takes a footpath on the left. This footpath winds its way around the back of housing developments at Stortford park before passing along footpaths between the houses, photo 24, down to the A1184. Crossing over the road the route heads over a stile and down the side of a field heading toward Great Plantings Wood, photo 25. Leaving the field the path heads right along a muddy track that leads to a subway under the A120. Once under the road the route turns left along the remains of the old road before taking a path that heads diagonally across a field to the right. Leaving the field by a gate in the far corner the route heads left along a track, over a couple of cattle grids and past the buildings of Hadham Park where the route joins a footpath over fields, photo 26, that lead towards the building of Hadham Hall. The route across the second field was a bit vague although it was just about possible to spot a marker post on the far side of the field. Leaving the field the path heads diagonally to the right past some tennis courts and turns right down the driveway of Hadham Hall. The route passes under an archway and on past a number of fine buildings now converted to housing, photo 25, which is where I finished this stage of my walk along the Hertfordshire Way. While the Hertfordshire Way bears off to the right I took a bridleway that ran down to the road by Church End farm to start my walk back to Much Hadham. I had walked 11.7 miles along the Hertfordshire Way for the day. From Church End it was a relatively easy walk of three miles back to Much Hadham. I crossed over the A120 and continued straight ahead along a track past Stone House Farm that leads up to tree lined Hoecroft Lane. Turning right along the unmade lane I followed this to Acremore Street where I turned right along the road before taking a bridleway off to the left, photo 29. This runs over high ground for 1 ¼ miles besides fields above the valley of the River Ash which was to my right before heading down towards Much Hadham. The only problem with this path was that being a bridleway as well, it was rather rutted up and uneven to walk on.The route crosses a road and heads along a footpath, which was blocked in a couple of place by fallen trees, that leads over the River Ash, photo 30, and back to the church from where it was just a short walk back to where I had parked. The total mileage I walked was 15.5 miles. This had been a truly glorious day for walking. Although the weather clouded over a bit in early afternoon the sun soon re-appeared. 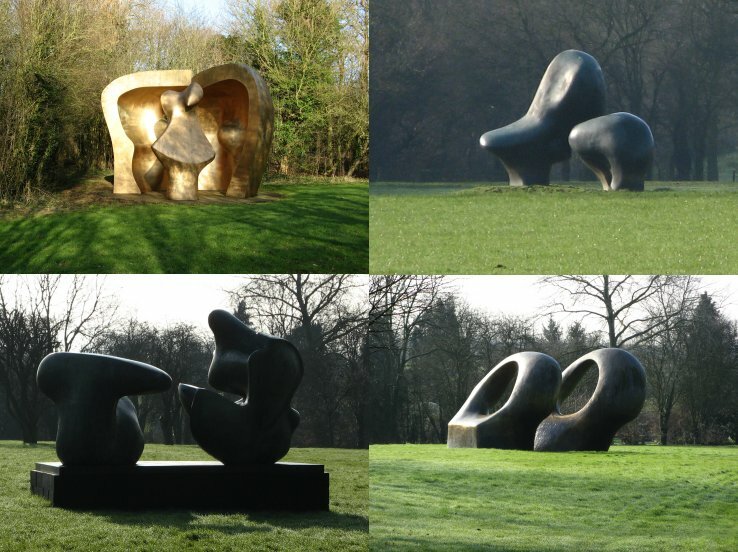 There was also a good mix of walking, with the river, open fields, the River Stort, the town of Bishops Stortford, the Henry Moore sculptures and a number of impressive building and churches to be seen.